I have occasionally used this series of posts to step outside the realm of books and discuss other media, such as movies. I generally avoid doing this for a number of reasons, chief among them being that it's long been my contention that old school D&D's primary inspirations were literary in nature and indeed literary within a specific sub-set of books and authors. That said, it's also true that D&D wasn't written to emulate the works of any particular author or literary series. Furthermore, an important ingredient in the creative alchemy that brought forth the game was its ability to draw on ideas from a wide variety of sources and incorporate them into itself, in the process producing an entertainment that was greater than the sum of its parts. A good example of this is the monk class introduced in Supplement II, Blackmoor, inspired by a variety of sources (ranging from Warren Murphy and Richard Sapir's The Destroyer series to the 1972-1975 TV series Kung Fu to Carl Douglas's hit single "Kung Fu Fighting.") but nevertheless transcending its roots in order to become a unique element of D&D. The same is, of course, true of the cleric, which by most accounts was inspired by Peter Cushing's portrayal of Dr. Van Helsing in numerous Hammer horror films watched by Dave Arneson in the late 60s and early 70s. Hammer Film Productions was (and is -- the name has apparently been revived in recent years) one of the most prolific and influential creators of horror films during the late 1950s through early 1970s, producing dozens of films that firmly established a particular approach to horror as definitive. This approach combined tight scripts, clever direction, and superb casting to create moody, suspenseful films that punched far above their weight when it came to budget. It's also worth noting that Hammer's films were extremely daring when it came to gore and sexual content, which likely contributed to their success, although, by today's standards, the films are (mostly) quite tame. Indeed, having spent the last couple of weeks watching many of these films, I'd argue that the tension between the filmmaker's desire for greater explicitness and the censors' concerns created films that are more satisfying than both the more sanitized films made by Universal Studios a generation earlier and the no-holds-barred style of the 1970s and later. 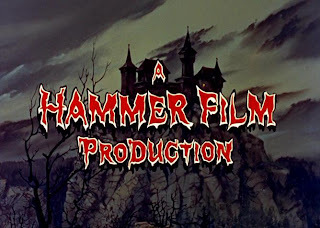 Though called "horror" films and filled with many horrific and disturbing ideas and images, what's most notable about Hammer's best films is that they are, with few exceptions, adventure films, in which representatives of "the realm of Law" venture forth into a Chaotic stronghold and do battle against its minions. Watching The Brides of Dracula or The Devil Rides Out or Quatermass and the Pit, it's easy to see what exactly what so inspired Arneson and how these films had an impact on early gaming. Indeed, for all their breaking of societal taboos, the Hammer films (generally) have a very conventional morality at their hearts: good triumphs, evil is defeated, and life goes on -- until the next time Chaos again enters the world. They're great models for roleplaying adventures in terms of structure, characterization, and mood, not to mention the terrific characters. Ravenloft takes a lot of licks on this blog and rightly so, I still feel. But, leaving aside its worst excesses, it's the very model of a Hammer horror movie turned into a D&D adventure. I've often thought that, stripped of its heavy-handed central melodrama, it could have served as an ideal bridge to the prehistory of the hobby, a reminder of some of the genuine cinematic antecedents of D&D. I still think this is a worthwhile endeavor, one I toy with from time to time in the midst of my other projects. Of course, lots of gamers fervently believe that "D&D can't do horror" and, I suppose, they're right if one's view of horror is overly psychologized and personal, but then I don't think this "defect" is unique to Dungeons & Dragons. On the other hand, as the Hammer films show us, horror isn't just something one can feel on a personal level; it can be something broader, such as the revulsion Paul Krempe feels as his friend Victor von Frankenstein presses on with his mad researches, disregarding the laws of both God and man. Or the danger posed by Dracula, as his lust for blood creates yet more of his kind. Or even the dark reflection of human nature seen in the prehistory of Mars discovered by Professor Quatermass. It's all terrific stuff and great fodder for gaming. I heartily recommend tracking down a couple of Hammer films and setting aside some time to watch them. They're well worth the time and I daresay that viewers whose primary experience of horror movies stems from films made since the 1970s are in for a treat. I'm loving the recent Hammer posts, James. Are you watching a particular boxed set collection of Hammer films, or just plucking likely titles off the shelf? I'm just grabbing what I can, supplemented by some films made available through a friend. In North America, some of these movies are hard to get on DVD, so you have to settle for old VHS tapes, which is a shame, because these films deserve to be seen in the full colorful glory. The old Hammer films were a prime example of "less is more." Sure, they danced around the edge of risque for their time, but so did the "brides of Dracula" scene in the original Dracula novel. The difference here is the skill with which the films were made, not the amount of skin or violence. I don't know what they feed them in England, but they produce some of the best actors you're ever going to see... and look at the casts of those Hammer films, and you'll see names that are still going strong. How do you follow an act like that when you don't have that kind of talent and power to draw on? Well, you overdo it. Hence, what followed. I very much agree that Ravenloft can serve as a bridge to the roots of the hobby and its antecedents. I don't agree that D&D can't do horror. I might agree that some DMs can't do horror... regardless of the edition you're playing with. It's not horror as such, but I heartily recommend Hammer's Hound of the Baskervilles (with Cushing as Holmes), as it's a superb piece of work. Captain Kronos: Vampire Hunter is a pretty good one too, playing up the pulp swashbuckling even more than the rest of their films. I'd also recommend Carry on Screaming. It's one of the long line of Carry on... spoofs, many of which are awful, but this one takes Hammer's films as its inspiration, and stands up well alongside them. If you enjoyed Quatermass and the Pit, I'd recommend you watch the TV series too (if you can find it). Great 1950s British SF which does spectacularly well on what must have been a very small budget. The film is actually pretty good and respectful of the source material but the 1958 TV series (mostly filmed live) is still better, IMO: the former only really wins out with the SFX budget at the end. > good triumphs, evil is defeated, and life goes on -- until the next time Chaos again enters the world. They're great models for roleplaying adventures in terms of structure, characterization, and mood, not to mention the terrific characters. @Prince Herb: Big budget (~£17,500) compared with the original series (~£3,500). Probably worth a note, aside, that most copies of the 1958 TV series have the titles & credits cut between the episodes which is a bit of a pity IMO and rather jarring for one particular scene change required between episodes. I recently picked up a four pack DVD featuring the majority of the Dracula films for 10 bucks. That includes Dracula A.D., which is a better companion piece to Blacula than Dracula. Many are also available via Netflix, with the Dracula movies available on Instant. I could never understand why people dump on the first Ravenloft moduel so much. As far as D&D goes, The module was very well written and captures the original Dracula story better then anyone else at the time . For years, vampires in the game were no different then any other critter the PC's would encounter. But in Rqvenloft, you had Strahd von Zarovich: a very powerful and cunning adversary and was not just encouraged --but DEMANDED--by the authors that the DM play him as the arch villain that he was and not just another " thing" for the PCs' to kill and loot. Plus, the maps of the castle were some of the best even drawn for a moduel by Dave Sutherland- another victim of abusive fandom. My primary issue with Ravenloft is that it's a great example of an adventure where much of the action is driven by NPCs. The whole Sergei/Tatyana conclusion, for example, is a terrible piece of melodrama that reduces the PCs to the role of spectators. Sutherland's maps are pretty but I found them less usable than the traditional orthographic map style of earlier modules. That said, I think Ravenloft is nevertheless a fun module filled with some clever tricks and traps. Castle Ravenloft makes for a great "dungeon" and treating a vampire as a wily and clever opponent is something I applaud. Unfortunately, Strahd, like so many NPCs in published material, grew larger than he ought to have, in so doing, diminished the PCs. Raveloft is a better module than I probably give it credit for, but it also kicked off a lot of trends I strongly dislike, which is why I give it such grief. You can't discredit it just because the module was successful and created a new franchise for TSR. If anything, that's a testament to how well it was written in the first place! Sure, it has flaws, but so has every module thats ever been published. But as a whole, I think Ravenloft gives the GM more then then enough material and ideas to change and make it fit into his campaign just about anyway he/or she choses. Don't like the melodrama at the end--change it and have the PC's witness Strahd kill her in one strike like Christopher Lee's would do in one of his Dracula films. I still disagree with you very much on the maps. I'm not saying every dungeon should be illustrated that way, but it was an interesting change to previous designs and predated the kind of mapping you see in videogames such as Diablo. We are all ardent fans of the Hammer horror films, too. Coincidentally, my girlfriend's dad is a huge Hammer Horror and EC fan, and she brought me over some comics and Hammer Horror trading cards to look at last night. Going through the Hammer cards now. Actually, I think you're overly-hard on Ravenloft, to a sort of ridiculous degree. The vampire's backstory is such an incredibly tiny part of a great module that I'm baffled as to why you fixate on it so. Before this very interesting topic becomes completely dominated by a discussion of Ravenloft (if it hasn't already), I'd like to point out that U1 The Sinister Secret of Saltmarsh owes a fairly substantial debt to Hammer's Captain Clegg (aka The Night Creatures), as well as some of the less well-known nautical/pirate adventure movies (The Devil-Ship Pirates, e.g.). The reason I "fixate" on the backstory is because it's precisely that element of the module that made it so successful, influential, and -- most importantly -- imitated. If you read my retrospective on Ravenloft, you'll see that I don't in fact hate the module at all; indeed, I remain quite fond of it, despite those elements of its design that led to changes in later modules I dislike. Much like Unearthed Arcana, another old school product I dislike, it doesn't matter that the bad stuff takes up far less wordcount than the good stuff that matters. What matters is how it was received and used by others at TSR to change the direction and complexion of D&D. It isn't just D&D that Hammer has had some influence on: Sandy Petersen has commented numerous times on the importance of Quatermass to the "Petersenian" approach to Call of Cthulhu. Open Friday: "Don't Worry, Rufus ..."